Meet Moustafa, our front-end developer & graphic designer. He converts our ideas into visuals and allows us to communicate with you. This amazing website you’re on; is officially made by him with the help of the team. Mous is a hard-working guy and might seem real serious at first, but he appreciates a good joke from time to time. 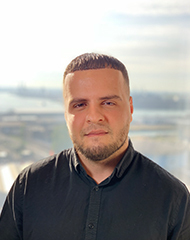 Moustafa started in March of 2018 after being recruited via Linkedin. He visited the website and saw a lot of potential in the product, which motivated him to apply. After a short interview both parties were convinced of the fit and he’s been a part of the team ever since. Outside of the office Mous makes sure to stay busy. He enjoys doing design work, watching tutorials and learning more about front-end development. Fun fact, Mous is a self-taught piano player and enjoys watching anime. He likes living in the Netherlands but also enjoys traveling and would someday like to visit Japan and South Korea. Mous likes the open office approach we have here at Capptions. It allows him to ask for help whenever he needs it. Mous really loves what he does, and it shows, he’s a real team player.